NEW YORK--(BUSINESS WIRE)--Besyata Investment Group and The Scharf Group, both NY-based single family offices, have acquired One Dartmouth Place in Denver, CO for a purchase price of $65.5 million. 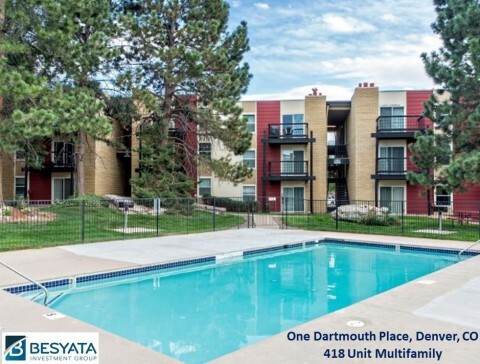 One Dartmouth Place, within five minutes of the Denver Tech Center, is a 418-unit Southeast Denver apartment community offering one of the most comprehensive amenity packages in its submarket as well as an abundance of nearby recreation, including a 27-hole public golf course, an 880-acre reservoir, and a 71-mile hiking trail. Located less than a half mile from the Nine Mile Light Rail Station and I-225, the community benefits from convenient access to metro Denver. The property sits within 20 minutes of roughly 30% of Colorado’s GDP, 36M SF of office space, 440,000 employees, and 8 Fortune 1000 companies. It is also within close proximity to some of the region’s most popular retail attractions, including Park Meadows Mall – Colorado’s largest indoor shopping center.